Between the scorching heat of Wisconsin summers and the bitter cold of their winters, travel in Wisconsin can be unpredictable. So if you’re planning a visit to Wisconsin, it is best to come prepared for anything. Here are some of the best travel tips when planning your Wisconsin getaway. Whether you are traveling in the summer, fall, winter, or spring—always pack layers. Wisconsin is notorious for being chilly when you wake up and easing up throughout the day during spring and summer. During the winter months it is a necessity to pack a lot of warm layers if you will be participating in any of Wisconsin’s outdoor activities. Wisconsin winter temperatures can fall to 20 below zero but usually stay in the teens and single digits. Not only does planning a Wisconsin getaway in the fall and spring call for a beautiful trip—it also means no mosquitos. Wisconsinites joke that the mosquito is the state’s second state bird. 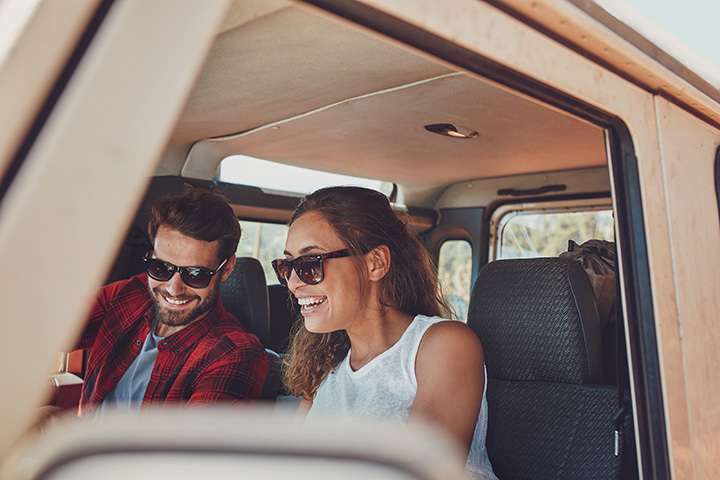 Not only are you avoiding these nasty, vacation-ruining bugs but you are also traveling before and after our peak season (summer), which in turn costs less money for you. While the highways may be faster there has been a rise in road construction throughout the state. Taking backroads when you can, can avoid sitting in traffic, and is a much prettier view of Wisconsin’s natural beauty. Purchase a small tub of cat litter and keep it in your trunk. Wisconsin winters can see up to 50 inches of snow per year, and it is not uncommon to wake up to a foot of snow in the morning. Dashing some cat litter or sand on snow or slick ice is a great trick to help your winter commute be a little smoother. Both sand and cat litter add for better traction. You can’t buy Spotted Cow anywhere else in the world besides Wisconsin. Visitors can purchase in Wisconsin and bring a case back home but distributors are not allowed to sell outside of state lines. That’s what makes it so special. So if you were planning on getting someone a souvenir from the state, forget the keychain and pick up a six pack of Spotted Cow from New Glarus Brewing Company. When in cheese curd country, one should never go cheese curd-less. This is a Wisconsin travel necessity and a great snack for any type of occasion. Almost any convenience store sells a bag but if you want the good stuff visit Mousehouse Cheesehaus in Windsor. Winters are brutal in Wisconsin. Invest in a hooded, waterproof, windproof winter jacket. Nothing is worse than buying a jacket for looks and not warmth in a state that is notorious for cold winters. Invest in goose down/insulated winter jacket to keep out the bitter cold. Dane County Regional Airport (MSN) in Madison and Appleton International Airport (ATW) are great ways to travel on a budget or for convenience. When planning a trip, always check both of these local airports for great deals. Depending on where you are traveling to or from they are very convenient for many Wisconsin travelers. Since not too many people cross check their trips at these airports, they tend to be less crowded and call for quicker security check lines. If you are the camping type, you must invest in a yearly state park vehicle pass for stopping in state park and recreation areas. These passes are only $28 if you’re a Wisconsin resident and $38 if you are an out of state resident. Unleash the possibilities of over 60 of Wisconsin’s state parks and recreational areas. Kwik Trip gas station and convenience stores were born and raised in Wisconsin. Not only are they clean and well stocked they have great deals. Kwik Trip is notorious for having cheap bread, eggs, and milk—the basics for every traveler. Not to mention their hot food blows any other gas station out of the water. You cannot plan a trip to Wisconsin without stopping in the Wisconsin Dells. Packed with water parks, resorts, and camping—it is the perfect place for any type of traveler. While it is a great tourist town in the peak season, beat the crowds by finding summer water park passes and hotel deals for cheap. One might even think about purchasing a coupon book for an extended stay in the area. Another winter in Wisconsin tip—ask for your used gift cards back…turns out they have a place in this world. If you forgot an ice scraper, credit cards will do just fine. Go through the normal winter defrost procedure and use the credit cards thin, yet durable sides to scrape the ice off. While you will still want to end up purchasing a real ice scraper, it’s a great way to improvise if you are out of options. There are so many great summer and winter activities. On the flip side there are only so many nice summer days in Wisconsin as well. Make sure to make the best of the short time by kayaking, boating, running outside, eating outside, and swimming. There are so many great spots like Door County and Apostles Island. There are many great fun water ways to travel. Try taking the family tubing down the Wolf and Sugar Rivers. Better yet, have a relaxing Wisconsin Ducks Water Tour down the beautiful Wisconsin River. There are so many wonderful ways to travel on the water in Wisconsin. Wisconsin is one of the friendliest states, so it’s no wonder it has a plethora of tourists in the peak season. If you are ever unsure about what to wear out—always choose Packers attire. It’s the perfect conversation starter and everyone love the Green Bay Packers in Wisconsin. While you’re at it, stop by Lambeau Field in Green Bay to visit the historic field and learn about the only publically owned NFL team. Wisconsinites are proud for a reason!